in the long backstreets of our entwined thoughts. as I read the silence in-between your and my words. splitting in two people’s minds and hearts. and the time without a beginning or an end. so we no longer know who is you, me, and who is us. the day will set them free. piece by piece recreated by the stars. and who’s the sky’s king. into the silver lining in-between the clouds. with the oceans and the bays. gently push snowflakes out of blue eyes. 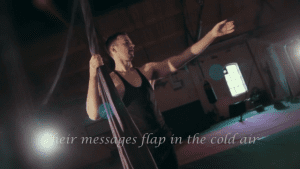 their messages flap in the cold air. But their bodies are miles apart. They know that they will never be equal. that they are just reflections. the line between who is her and who is him will be blurred. The whole universe will harp their particles to where they belong. rising up towards him, the Sun. portioning time into manageable chunks. his shiny presence into her black memory. or soften dust into golden. Sun and Earth break-up at dawn, unite at daybreak. The sky pours their sketched kisses into a blue-grey ocean. A dancepoem is a synergistic combination of two arts: dance and poetry. It is a hybrid specimen that bears resemblance to both arts but remains distinct when compared to either poetry or art. A dancepoem is not poetry accompanied with dance or dance accompanied with poetry. Also, a dancepoem is not poetry about dance or dance about poetry.A dancepoem is poetry and dance together, like two halves of a broken heart. I have been experimenting with music, dance and poetry to see if carefully controlled convergence of three arts can give rise to a new poetic experience. Between 2015 and 2017, I was fortunate to work with three very talented dancers. The theme binding our three dancepoems together is celestial dialogues- conversations between The Sun and The Earth, The Moon and The Sun, and The Earth and The Moon. When thinking about these conversational duets, the search for a ying-yang balance becomes a quest for unity and departure from human-imposed hierarchies. Eleni Cay is a Slovakian-born poet living in the UK. Her most recent poems were published by Eyewear Press in December 2017 and appeared in Atticus Review, Glasgow Review of Books, Poetry Ireland Review, Acumen and Envoi. Eleni’s award-winning collection of Slovak poems ‘A Butterfly’s Trembling in the Digital Age’ was translated by John Minahane and published by Parthian Books. Eleni is known for her filmpoems, dancepoems and multimedia poetry, which have been screened at international festivals and featured on Button Poetry. She has been invited to read her poetry at the Harvard University, International Ars Poetica Festival, Frankfurt Book Fair, Villa Trebitsch in Vienna, Blackwell’s in Manchester, Poetry Cafe in London and many other beautiful venues.